Ipomoea pandurata. © Copyright Bobby Hattaway. 2011-5.www.discoverlife.org (Accessed 5/2014). Ipomoea pandurata is a perennial vine from a large, deep tuberous root, stems trailing or slightly twining to 5 m, forking, often purplish. Leaves alternate, heart-shaped, to 15 cm long, tip long-pointed, base deeply lobed. 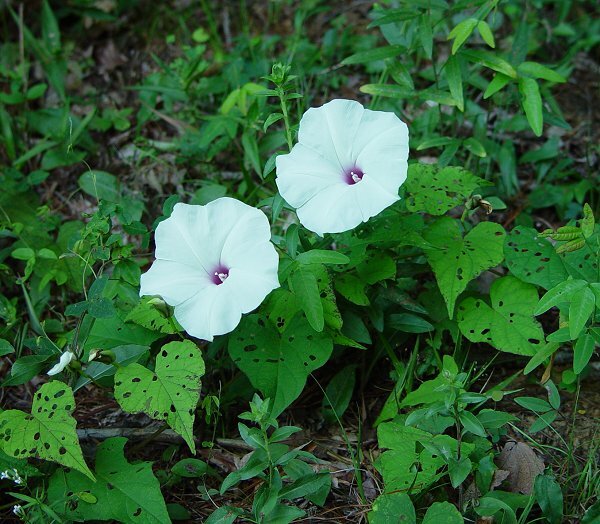 Flowers white with red-purple center, to 8 cm long, 10 cm wide, funnel-shaped, sepals to 2 cm long, oblong to egg-shaped, tips blunt; inflorescence of 1-7 flowers on a stout stalk, longer than leaf stalks; blooming and fruiting June-Sept.
Fruit dry, hollow, a 2-parted capsule. Habitat: Dry woods and successional habitats.